Cruise ships dock at the El Guamache port. If more than one cruise ship is scheduled, you might anchor and use tenders to go ashore. The port area has 120 vendor stalls selling jewelry, art, T-shirts, and a great variety of handicrafts in nice palm-frond roof booths. All are selling their handmade wares in US dollars, pounds, or euros, so there is no need to change money into bolivars if you're planning to stay in the port area and not go to see the island. There is also a small but nice and very clean beach for cruise tourists to enjoy. The access to this beach is absolutely free and it has clean restrooms/toilets. You can rent shaded lawn chairs, jet skis, paddle boats, and banana boats there. You will not see local islanders on this beach - it is reserved for tourists on cruise ships. 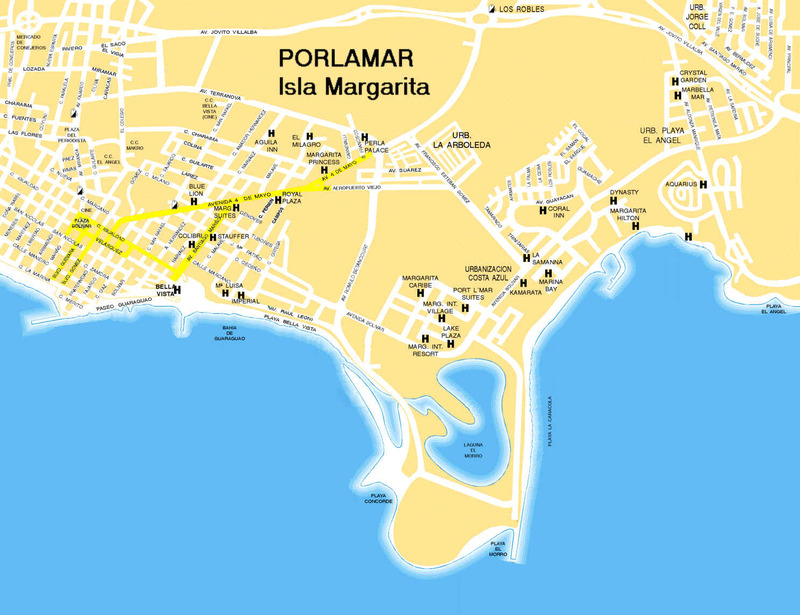 The port area is about 45 minutes away from Porlamar (the main town on the island). There are taxis available from the port, and 3 tour operators offering tours to the island's main attractions. La Isla Margarita, known as the "Pearl of the Caribbean", is situated 38 km north east of the mainland of Venezuela and far from the track of Atlantic tropical storms. Its location as an island in the Caribbean sea offers lots of beaches to explore, most of them virgin. Margarita Island is divided into two sections tenuously linked by a 24 km. sand spit which separates the sea from the fascinating Restinga Lagoon National Park. At its largest, Margarita Island measures 67 km from east to west ( Punta Ballena to Punta Arenas) and 32.4 kilometers. from north to south - 167 km. of shoreline liberally endowed with inviting beaches. The average temperature is 27 degrees Celsius and the annual rainfall averages 27 inches resulting in mostly arid landscapes with some wooded areas and fertile valleys. Over 300,000 people live on Margarita Island most of whom live in the eastern part where the capital of Asuncion and the shoppers paradise of Porlamar are located. The western part of Margarita island is called the Macanao Peninsula. It is sparsely populated and has seen little tourist development due to the limited availability of water. Wild deer, goats and hares roam the mountainous interior and the sandy beaches are only visited by the local fishermen. Busy Porlamar is the largest city on the island and best-known for its shopping. But it also has several cultural attractions, most of which are near the shady Plaza Bolivar. The Museo de Arte Contemporaneo Francisco Narvaez has a good collection of works by Venezuelan artists and focuses on sculptures, paintings and seriagraphs by its Margarita-born namesake. The museum, which is at the corner of Calle Igualdad and Calle Fraternidad, is open daily. On the waterfront near the town's old market is Faro de la Puntilla, a lighthouse at the end of Calle Fajardo. There is a lively beach next to the cruise terminal, with picknick tables, toilets, jetski rentals etc. This combined with some shopping makes for a relaxing cruise stop. Renting a car, scooter or bike is cheap and rewarding. It is easy enough to rent a car at the port and take a scenic drive around. Renting a taxi will cost about $25 an hour. Shoppers might want to reserve a day for a duty-free shopping spree in Porlamar. Shopping is great along Marino and 4th of May Avenues and Guevara and Gomez Boulevards. Snag some unique handcrafts, the latest fashions, or authentic pearl jewelry from the busy shopping outlets of Porlamar. Tourists also raid the markets and shops on Larina and Aurora Streets, where you're guaranteed to find good deals on clothes, jewelry, liquor, perfume, and shoes. Venezuela's currency is the Bolivar fuerte (BsF), which replaced the old bolivar on January 1, 2008 at the rate of 1 BsF to 1000 old Bs. Visa and MasterCard are widely accepted, American Express and Diners Club are usually accepted at upscale restaurants, hotels and shopping centers. Merchants always ask for ID before making a credit card transaction (a passport will suffice). ATMs exist all over the country. Around the cruise terminal USD are accepted. Elsewhere not. Spanish is the official language of Venezuela. A single emergency number 171 is used in most of the country for police, ambulance and firefighters. Shopping hours Mon-Sat 0900-1300 and 1500-1900. 19 Apr Declaration of Independence. 24 Jun Battle of Carabobo. 24 Jul Birth of Simón Bolívar.